Cubify offers everything from co-creation with favorite brands, a curated shopping experience centered around personalized fashion, décor, toys and more, a community inspiring the latest in 3D design and printing possibilities, and access to the easiest home 3D printers and related products. Shop the collections for things to print at home or have printed for you in high-end materials like precious metals, edibles from chocolate to sugar, and a range of full-color materials and higher quality plastics; discover the designer in you; join the community and share your print inspirations in the Design Feed; organize and display prints on your Shelf; and design your future, powered by 3D printing. 3D Systems’ consumer technology platform that powers Cubify allows for the safe hosting, publishing and production of branded and licensed content. 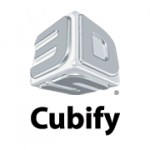 3D Systems also manufactures the Cube family of consumer 3D printers, the Sense 3D scanner and a suite of consumer design software, all available on the Cubify hub.